BERKELEY, CA: Rent control policies are key to stabilizing California’s housing affordability crisis, which has driven millions of people into poverty and displaced hundreds of thousands of others, a new analysis released Wednesday by the Haas Institute for a Fair and Inclusive Society at UC Berkeley shows. 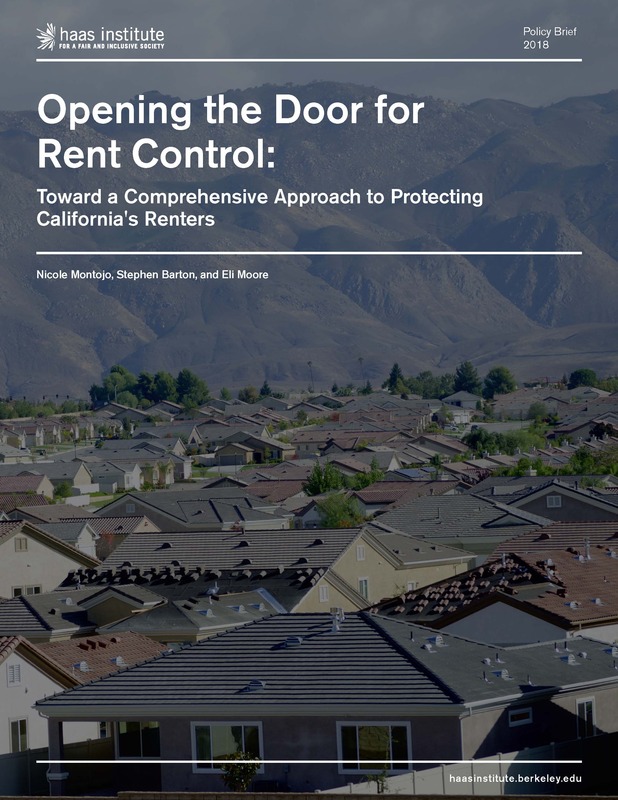 The research brief, titled "Opening the Door for Rent Control: Toward a Comprehensive Approach to Protecting California's Renters," finds that rent control, when applied with other housing policies, can prevent housing costs from spiraling out of control and forcing families to leave their neighborhoods. “While California is faced with a range of housing issues that require us to pursue various policy goals, the goal of addressing the housing affordability and displacement crises facing overburdened renters must be prioritized,” Nicole Montojo, a Haas Institute housing analyst and co-author of the paper, says. The analysis comes out ahead of a November ballot initiative that would repeal the 1995 Costa-Hawkins Act, a state law that prohibits cities from adopting rent control ordinances on single-family homes and condominiums, as well as any home built after February 1995. If passed, Proposition 10 would allow cities across the state to consider adopting rent control on all types of housing, including new developments, which, according to the Haas Institute’s analysis, would significantly and more quickly provide relief to millions of renters struggling to afford housing costs. Alone, no single policy, including rent control, can solve California’s housing crisis, in which 54 percent, or roughly 9.5 million Californians living in renter households, are overburdened by housing costs, meaning they spend at least 30 percent of their incomes on housing. But while other proposed remedies to the housing crisis may take years before they impact housing costs, only expanding rent control can offer immediate relief to millions of people in danger of being forced from their homes, according to the research. The urgency and nature of the housing crisis is not limited to displacement, but research has shown it is also directly linked to issues of physical and mental health, racial and economic segregation, traffic congestion and air quality, academic performance of our youth, and many others. For example, research has shown that compared to those with stable housing, people experiencing housing insecurity are nearly three times more likely to be under frequent mental distress due to a number of factors, including hazardous living conditions like pests, mold, and toxins, as well as a disconnect from community and social networks and sources of support. Regarding homelessness and poverty, California ranks number one of all states in both these areas. On a given night, more than 134,000 people sleep without a roof over their heads, and the figure is rising. Trends indicate a clear relationship between increases in rent and the growing number of homeless people. Meanwhile, teachers, health services providers, service workers, and others are being priced out of the places where they provide services, and forced to relocate to suburbs or regions far from their jobs. This increases road congestion and smog, bringing down the overall air quality, harming both the environment and people’s health. The housing affordability crisis also reinforces racial and economic segregation as those who are hit hardest by the crisis are seniors, Latinos, African Americans, low-wage workers, and families with children. Importantly, the analysis also shows that in many cases, rising rents are not the result of a landlord’s investments, they are the result of government actions to enhance neighborhood conditions, such as improvements to schools or parks, financed by the public. Thus, the brief argues, government has a responsibility to ensure that these public improvements do not translate to higher rents for tenants. “When the housing market is as dysfunctional as it is in many parts of California, tenants are effectively subsidizing landlords with rent payments above what a fully competitive market would allow landlords to charge,” Stephen Barton, a former housing director for the City of Berkeley, and co-author of the research brief, says. In addition to rent control and other tenant protection measures such as “just cause for eviction,” the analysis shows a need for increased housing production to meet an affordable housing gap of 1.5 million homes for extremely low- and very low-income households. Other recommendations to address the housing crisis include preserving existing affordable housing like income-restricted units; equitable community participation to ensure responsive and inclusive housing decisions; and access to housing for socioeconomically disadvantaged people in places that connect residents to opportunities and break patterns of segregation. Access the full report on this page.